2010 saw the launch of the brilliant live music festival Melbourne Music Week and this year it is back with a bang - louder, bigger and certainly brighter thanks to KUBIK Melbourne - but more on that later. Melbourne Music Week will be held from Friday 18th to Saturday 26th of November 2011, which is timely given December marks the start of some great Summer gigs and festivals - some of the anticipated events of the season include the Foo Fighters Wasting Light Tour, Roger Waters: The Wall Live, Big Day Out 2012 and Soundwave 2012 just to name a few. Melbourne Music Week, like last year, will be held in and around various Melbourne venues and sites; this year there will be no less then forty locations. Live music sites will include Federation Square, the Old Melbourne Gaol, St Michael's Church, Melbourne Central Rooftop, ArtPlay and many more. One of the new exciting venues, designed for Melbourne Music Week, is KUBIK Melbourne, which will be located in the lower terrace of Birrarung Marr. It is a temporary structure which will play host to a wide range of events, including a number of live music performances, public lectures and workshops. This impressive structure has toured the world and will certainly be one of the major highlights of this year's festival. Some of the anticipated events taking place in KUBIK Melbourne include Sweet Beat Manifesto, Tune in Tokyo, Melbourne Live, Espionage and Racket. What's more is that KUBIK Melbourne by day will be home to Chez Dré - a trendy French cafe, so you can visit this site either during the day or night throughout the run of Melbourne Music Week. Music on film also will be celebrated; Cinemix is a special event which will see Melbourne's own Midnight Juggernauts perform live to a selection of 1960s newsreels - titled Look at Life (1959-1969). This one night only performance is just one of the many highlights of the forthcoming festival. Another highlight is the four part event Playing Under the Influence, which will see musicians Mick Harvey, Tim Rogers, Vincent Vendetta and Henry Wagons present special screenings of feature films which have inspired them at ACMI. Selected feature films include All Night Long (1962), Dead Man (1995), Dawn of the Dead (1978) and Billy Liar (1963). There will also be a range of workshops and conferences, including Sounds of the City, The Live Landscape and Releasing Internationally. Kids also get their own special program of events which will include DJ Kidz Workshops and a DJ Kidz Party - these events will be held at ArtPlay. Some of the local and international artists expected to participate in Melbourne Music Week include Cut Copy, Midnight Juggernauts, The Gaslamp Killer, DJ Krush, Die Vögel, Alexkid, Wax Tailor, HTRK, Canyons, World's End Press, Primitive Calculators and many, many more. 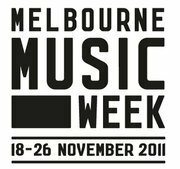 The full program of events will be unveiled on the Melbourne Music Week website on Wednesday 19th October 2011, so keep an eye on the Melbourne Music Week website, Facebook profile and Twitter for all the latest news and events. Some of the events are free, while others are ticketed. Tickets will be available directly from the respective venues. For more information on ticketing please see the Melbourne Music Website, located here.